A native of Ontario who's been musical since she was two, Grammy nominee and self-proclaimed skate punk Avril Lavigne was offered a deal by Arista Records at the tender age of 16. Our matching folio to the highly acclaimed debut from this teen singer/songwriter superstar features the smash hit singles Complicated and Sk8er Boi and 11 more: Anything but Ordinary - I'm with You - Losing Grip - Mobile - My World - Naked - Nobody's Fool - Things I'll Never Say - Tomorrow - Too Much to Ask - Unwanted. We're proud to present the matching songbook to rock 'n' roll wild child Avril Lavigne's sophomore release. Includes: Don't Tell Me - Fall to Pieces - Forgotten - Freak Out - He Wasn't - How Does It Feel - My Happy Ending - Nobody's Home - Slipped Away - Take Me Away - Together - Who Knows. Includes 6 pages of color photos. This #1 pop hit from 2007 by Avril Lavigne is a gutsy anthem of teenage love and jealousy that will be tons of fun to perform! Your SSA group will steal the show!Available separately: SSA and ShowTrax CD. Performance Time: Approx. 3:04. This 2007 pop hit by Avril Lavigne is a guitar infused power ballad that will give your program an emotional shot of adrenaline! You know, we'll make it through...just stay strong, 'cause I'm here for you - keep holding on. A great showcase for SSA choirs! 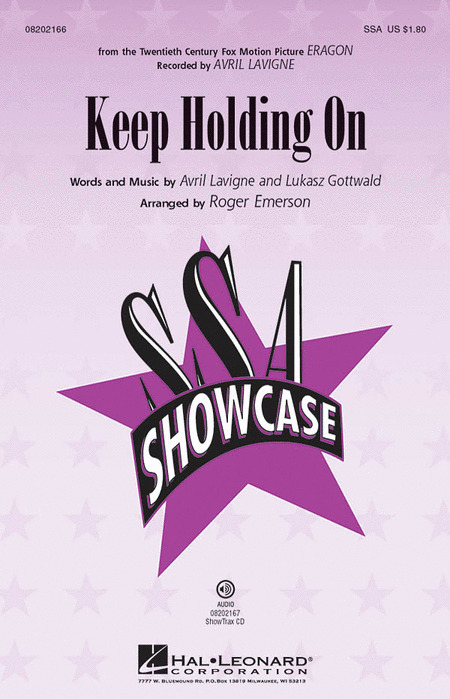 Available separately: SSA, ShowTrax CD. Duration: ca. 3:30.